@maxpro4u I don't know I haven't used Mplayer in forever. @Runtt- In response to your post a few pages back I'm curious,what do you foresee for macpup in the future? The most complete e17 puppy distro, or the most compatible e17 puppy disto? That depends on what all you mean like that. I would like to have a pure e17 distro with out any other wm's But I may not do that. There have been times in older macpup when something would run better in jwm than e17.But who knows..... They have so much stuff for e17 now, a webkit browser and media player, etc . That stuff may be more than I can pull off.My main goal is to have macpup continue. I had so many problems with the last 3-4 snapshots in 4.3.1 ,That is why it took 6 months for a new macpup to get built. I really thought that macpup was coming to an end.If not for 01micko tipping me off to lupu , This projects could have been Done. And now our little macpup is in a dog fight at DW,only 65 hits out of first place. Today a little info about themes and backgrounds. Personal themes/backgrounds are in /root/.e/e/themes or backgrounds. 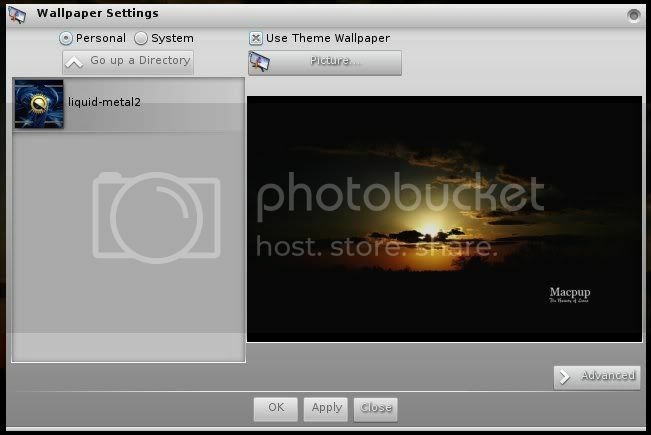 System themes /backgrounds are in /usr/share/enlightenment/data/themes or backgrounds. [please note this is only for mp 511]Most backgrounds will still work after you run edje_convert on them. For example take a background PUP1.edj .Put it some where you can work on it like /root/working , open rox there and run edje_convert PUP1.edj after that move it where it goes and run it. Use menu -settings-themes or wallpapers to change stuff. 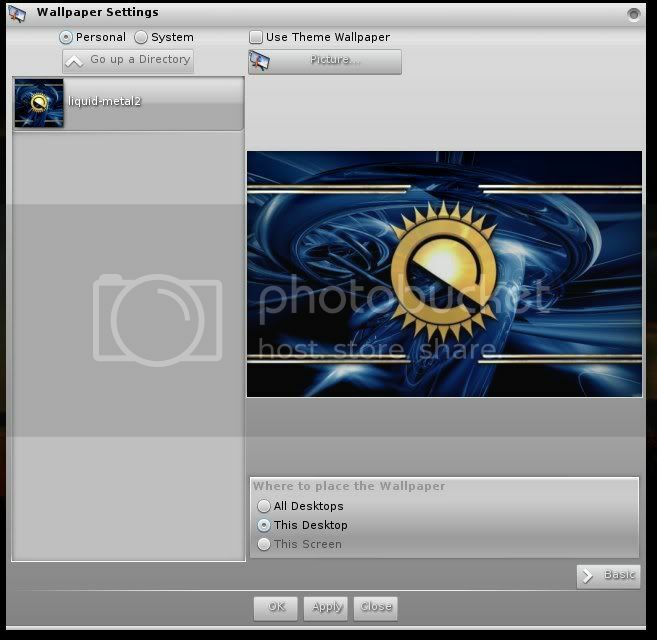 If you want to use your own background ,put the png or jpeg where you can find it .Then open the wallpaper settings window and click on picture. Then in the window that opens go find and select it .You then get some options to pick from after that it will build a .edj file for you and install it. If you click on the advanced button you can chose to have the background only on one desktop or all of them. After using edje_convert on an old background..
Runtt21, I tried something today...Compositing..
@cgt_1991: I don't know why are you getting the hotpink screen in Urxvt. I always run Macpup with Xorg and 24 bits depth color. Maybe it's related to your problem, but I'm just guessing. By the way, I've just made a logo for Macpup; maybe you'll find it interesting. It's a first try, just an idea I've had and I wanted to share it. txemijendrix.com: Graphic and Web Design. Between Kitchen remodeling and fixing motorcycles I did not have much time or energy to get my Desktop to look the way I wanted it to. Tried both txemijendrix and CatDude how tos. Both worked OK for me but was not happy with my look. So I tried something different using default E17 Theme and backround. Not using qiv or feh. Below is what I ended up with. Simple and elegant for Me (IMO). Different strokes for different folks is all. Everything below "Text" in /etc/conky.conky.config is in one long line since this is a horizontal conky. My simple startup script Works for me. Just make a text file in /startup and make it executable. @ puppyluvr read the first post in this thread again. Esp the part about dont load composite. @txemijendrix that's cool But We want to avoid anything with apples or anything real osx looking . Not a good Idea. We dropped back to #7 today at DW, Things will start to settle down soon. The next thing I want to show is the use of EFM the enlightenment file manager. It is cool BUT I need to show a few thing bout it. I'll start on that later. Some new themes on the way in a few days. I just picked up a used compaq evo. Macpup runs great(and so does the other pups I put on it already) but it is running a lot hotter than luci238 (which I am using at the moment). Is there a setting for the fan? I'm Max Wachtel and I approve this message. @ maxpro4u You need to use the CPU scaling tool, Menu-Applications-utility-Cpu Frequency Scaling tool I have never used it .I have never had a problem on any of my computers with them running hot in Macpup or puppy.I know they changed it in the latest Lupu but I don't remember what they did. @ puppyluvr Dude,99% of mnt/home ? Not good.So what happened?It crashed and now it's working ? Did you change anything? You should also mention that you are testing my update for itask-ng. Look Joel , No reflections !!!! No apples now. Only Enlightenment and Puppy.